It’s nice to have such good friends in the umm.. construction business, right? Though Obama is every bit as corrupt as thugmaster K, he is still a man who desires a presidential legacy with an appearance of ethical high ground; even as difficult as it might be to color as such. The soon-to-be-former-president might find the Oklahoma prison inmate to be too hot a potato for the ‘king’s pardoning’ pen at the expiration of his socialist ministry. As a native Detroiter, I am well aware of the things that Mr. Kwame Kilpatrick has done wrong. I believe he should pay for his wrong doings but 28 years in prison is just too excessive. Prior to you Mr. Obama, I had not believed a black man could be President until I saw how Kwame galvanized the City of Detroit and without his mistakes the sky could have been the limit for him. He gave the city hope again, brought investments in and he truly did make a positive impact in a community that had been headed for destruction since the 50’s because labor costs, white flight and the decline of the Big 3 automotive companies. If by “galvanized” you mean inspiring the criminal aspirations of Detroiters? Oh, and BTW… “Hope” is an upgrade from simply wishing for something. It requires participation and something spiritual is a bonus qualifier. Blaming “White flight” is a canard as well. Are you saying that blacks don’t have the capacity to do great things? I recognize that yes, Kwame is not without fault and has done wrong and should have to pay for what he has done, but let us remember that we are not talking about a career criminal. We are talking about a man with multiple degrees who rose to Mayor in one of the Major cities in the country when he could have fled the ruins of Detroit and taken his talents to Washington or the private sector. Instead he took the rains of a sinking ship and did a better job than anyone could have expected. Yes. He was responsible for his actions, and is ‘paying’ for his actions as the result. As for being a career criminal? 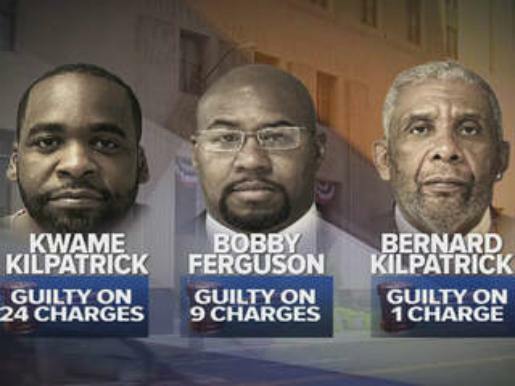 24 of 30 Counts convicted. Let that sink in. I plead with you to support change for Kwame. This is yet another extremely intelligent black man that we are going to allow to rot away in prison. Instead he could be released and given the opportunity to work for the State and City government to educate young politicians on the slippery slope of corruption which every Senator, Congressmen, State Rep, Governor, Mayor, Aldermen and City Council member face everyday. Everyday one of these elected officials is walking a tight rope in between what is considered politics and what is considered racketeering and corruption. Pull Kwame out of prison and let him use his mind, his heart and his voice to shield other young politicians, black men and women away from the unfortunate trap he fell into. Yes people were hurt, yes people were mad but I have forgiven him and others will as well. Keep telling yourself that its always a trap they fall into. And this tight rope in between what is politics, and racketeering? As-if there is a fine line between the two? Everyone deserves a second chance and I believe the City of the Detroit will be a better place with OUR Son out of prison and back home doing the work to rebuild his family, city and his reputation. Kwame is just too smart to be in prison and it is a disservice and an atrocity to lock him away for that long. His wife and children are barely surviving. They are being watched and hunted down by the government for any money or help they receive. It’s wrong and it needs to be made right. This is my final point. Adopt his family yourself. Those of us across the state continue to pay for all of the corruption of Detroit and it’s institutional depravity. Atrocities occur around the world, but this legitimate punishment of a criminal, for his criminal enterprise hardly rises to the “atrocity” level. President Obama you recently pardoned some people who actually sold drugs and were caught. The reason you pardoned them was because even though they sold drugs, the sentences they were given were too excessive. One of the people pardoned happens to be Denver Bronco’s Demaryius Thomas’ mother. This is a quote from the White House post the pardon ” These unduly harsh sentences are one of the reasons the President is committed to using all the tools at his disposal to remedy unfairness in our criminal justice system. Today, he is continuing this effort by granting clemency to 46 men and women, nearly all of whom would have already served their time and returned to society if they were convicted of the exact same crime today.” Even though Kwame was at fault while Mayor of Detroit….28 years is too excessive. “28 years is too excessive.” Or not. Misguided Social Justice and political criminal enterprise might actually be seen differently by most folks, ya know? Even the magnanimous and imperious Obama knows this, and will likely take a pass. There are too many black men in prison to date. Many if who were released may or may not make an impact. Let’s not keep a GOOD one in there for 28 years. Kwame can make an impact on SO many people the day he walks out of prison. Thank you in advance for your support and peace be with you for reading. My guess is that there are few “good ones” that are sentenced to 28 years. Kwame’s “impact” is still being felt by those in Detroit and the surrounding communities. His “impact” is being felt in the state of Michigan as a whole while taxpayers continue to pour dollar bills in the money sieve known as Detroit. One would think that limiting his “impact” might better serve us all. Don't forget the other half of the equation here. The soon-to-be-former Public Works Commissioner Anthony Morocco was the guy responsible for maintaining that section of line for several years now. He's currently vacationing at his condo in Florida right now. He's got about three days left in his term, but like all good democrats, he rather take in the rays instead of doing the job he was hired to do. And word around the Taj Macomb is that his lackies are getting a little nervous regarding their future job prospects with their boss out of office. Ditto for the outgoing County Clerk Sabaugh and her flying monkeys who have been sandbagging efforts to have a smooth transition of power in the clerk's office come January. I think the answer is simpler than that. Kwame can't offer anything to Obama, therefore Obama has no incentive to pardon him. It's not like they're best buds or anything. Obama would gain nothing by doing so. I believe that you are more right than you realize. Pres B.O. is taking a page from the Clinton criminal enterprise and shaking down soliciting donations for his post-administration activities. Paying for his own rounds of golf can add up quicker than you realize! Oh, I get you, but Obama has commuted or pardoned over 1,300 felons, many of them with nothing to offer except the color of their skin as proof they have been wronged. Political class inmates such as Kwame, and Blagojevich are unlikely to get the 'nice' treatment. Corruption was expected from Coleman Young down. It infiltrated the school system, the water system, any kind of construction, the bid system, employee medical/pension system--.all of it Thing is, anyone who complained was trampled by the corrupt team. The feds routinely looked the other way. Auditors routinely looked the other way--even governors looked the other way. There was a lot more than $28 Million changing hands--and those who have gone down are not the entire players. We, the rest of the state, will pay for this corruption mostly for like the rest of our lives. Detroit's bankruptcy only served to mask the fraud and corruption forever buried.